The best off-road solid tyre solution for skid steer loaders. Provides pneumatic comfort with zero flat tires and enhanced traction at the lowest operating cost. Specially engineered a puncture proof skidsteer tyre to meet today’s demands. The CAMSO SKS 792S (formally SolidAir SKS) is a premium skidsteer tyre option that has been designed with a quick-fit base for easy installation and less rim components. The unique sidewall holes are oval to resistant splitting under compression and staggered to mitigate cracking across the tread face. 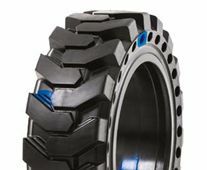 Unique compounding and design provide 40% better shock absorption and comfort that competition solid skidsteer tyres.